Those who have been to our Old Ordinary House Museum—or who have been to the home page of our Society website—have seen the gazebo or summer house in the shape of a small Grecian temple which sits at the top of the Old Ordinary garden. As well as being a charming backdrop for garden parties and the occasional wedding, this structure is a genuine piece of Hingham history. Its travels around town over the last two hundred years are documented by correspondence, photographs, and the written reminiscences of the Rev. John Gallop, one of its former custodians–all in our archives. 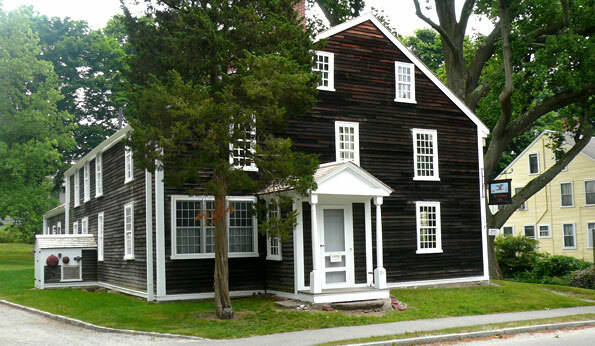 In the late 17th century, the Thaxter family built a house in Hingham Square, on the present day site of St. Paul’s Church. 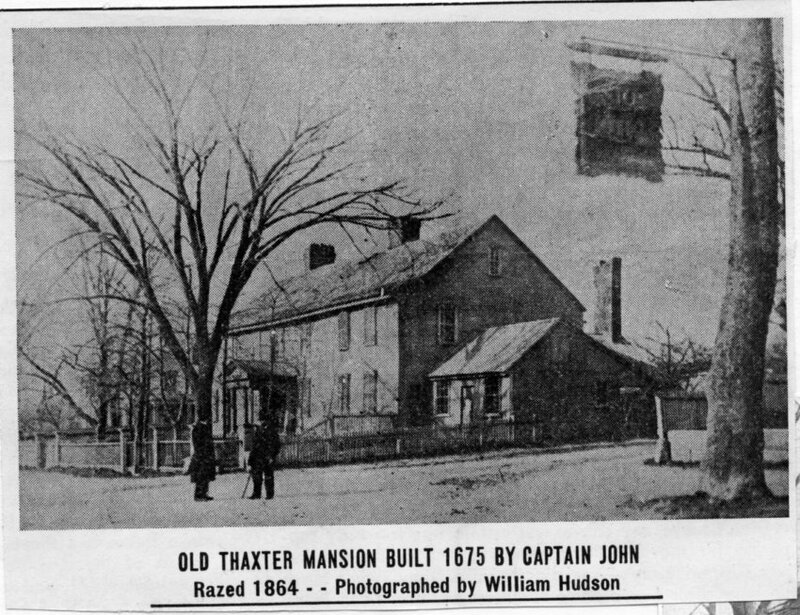 As added to and improved over the years, the “Thaxter mansion” grew into a large, attractive home, furnished with tapestries, tiled fireplaces, and painted doors—some of which were donated to our Society by Thaxter descendants. At some point, prior to the first photographs of the house but almost certainly in the first half of the 19th century, a classically-influenced portico, with a pediment and columns, was added at the house’s front door. Greek revival architecture was the fashion during the first half of the 19th century, and it sometimes took a more modest form than the Monticello or “Tara” models. Greek-influenced porticos were added to many older New England buildings. In addition to the Thaxter mansion, porticos with columns and a pediment were added to the Old Ordinary itself and (in an architectural mash-up) the English Gothic Old Ship Church. 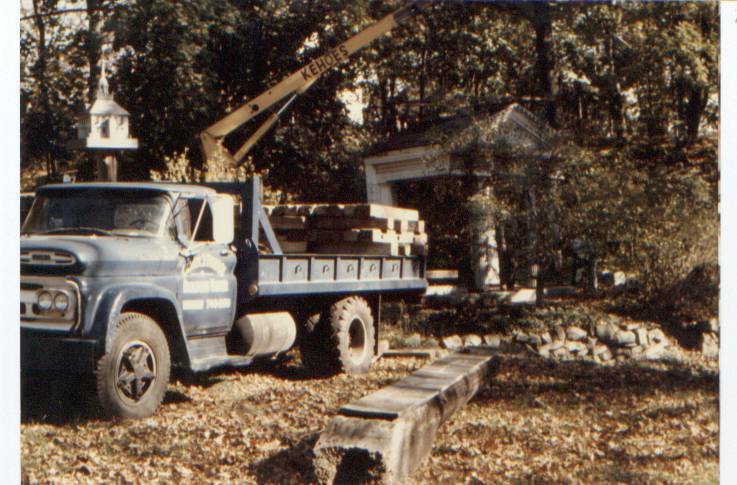 The Thaxter mansion was torn down in 1866 to make way for St. Paul’s Church, but the portico was saved. The story is that it was taken away by Hingham artist W. Allan Gay, but in any event, it was installed in the side yard of the Martin Gay house at 262 South Street, where it began its second life as a summer house or gazebo. Almost 100 years later, during an expansion of the South Shore Country Club, the garden area the Gay property was sold. The portico, which had fallen into disrepair, was threatened with demolition. The Rev. John M. Gallop, rector of the Parish of St. John the Evangelist, saved the portico from demolition. He sought and received permission to remove it. He installed it in the side yard of St. John’s Rectory, on Main Street next door to the church. Upon his retirement from St. John’s, Gallop donated the portico to the Hingham Historical Society. The decision was reached to add it to the formal gardens on the grounds of the Old Ordinary. (These gardens have a rich history of their own which would take another post to cover.) Still more preservation work was needed, but thanks to Gallop and many dedicated volunteers at the Society, the portico found a permanent home in 1979, not much further than a football field’s length away from where it was originally built. 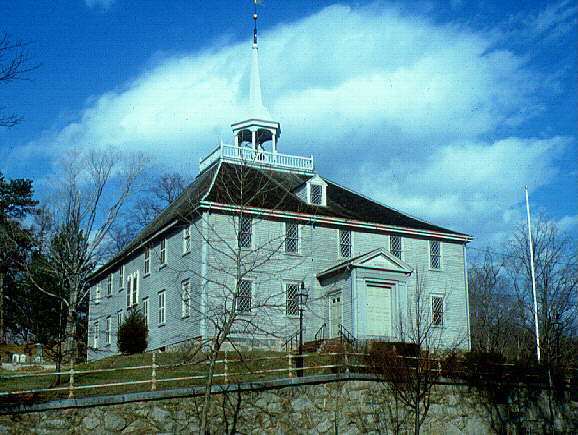 This entry was posted in Uncategorized and tagged architecture, First Parish, Gay family, Hingham Historical Society, historic buildings, John Gallop, Old Ordinary, Thaxter Family, W. Allan Gay.